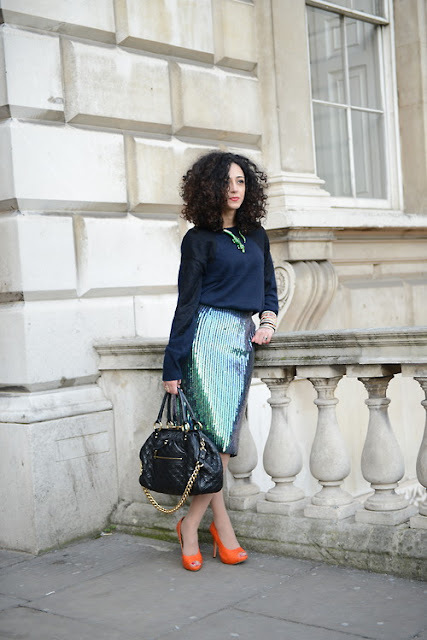 Fashion weeks these days are as much about the shows, new trends and designers as they are about streetstyle. But nothing prepared me to the streetstyle mayhem at Somerset House where it was more like paparazzi frenzy! The decision to attend London Fashion Week this year came late and I hardly had any time to prepare – or pack any outfits to bring from Singapore. But even if I did plan, my outfits after living eight years between Dubai and Singapore meant very little I owned was suitable for the freezing London temperatures. But it’s not all bad. 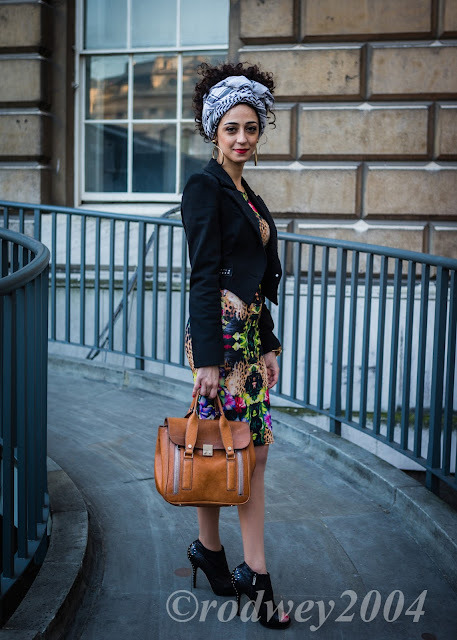 While I didn’t have time (or the budget) to shop for an LFW wardrobe I did manage to recycle the outfits I had worn and mix and match them with accessories and a few pieces I picked up between London and Beirut in the past few months. Vibrant on a grey London day: The atmosphere at Somerset House was amazing! The result was hit and miss. I wouldn’t say I’ve hit my highest points in the style stakes but I was pleased I could create different looks which were suitable enough to run around and attend the shows in. I just wished I had packed some of the emerging and local designers pieces to wear but being too summery meant I couldn’t. Most of my looks were a mixture of High Street and designer, although I did try to incorporate some Asian designers’ pieces whenever I could. It was probably the least effort I’ve put for such a big occasion but again I was there mainly for work, to attend a few shows and stand for hours chatting with designers at the various exhibitions. The vibe was great – although there was a bit too much blogger peacocking and some of the fashion was a bit overdone – I made a point not to do any streetstyle shots like every other person seems to do and concentrate on the stuff I came there for. That said, I didn’t mind posing for a few photos – especially that it seemed my relatively understated outfits attracted more magazines and photographers than bloggers. 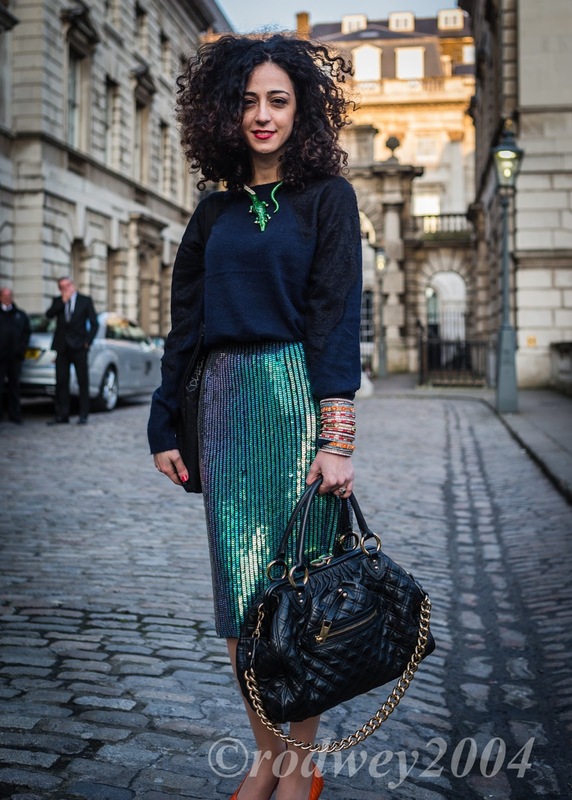 The highlight of that being spotted by Cosmopolitan UK, Woman and Home, ebay streetstyle collective (yes I know! ), H&M’s blog (I wore a lot of H&M during the 5 days) and a couple of nice photographers who seemed to know what they’re doing. Day 1 was the busiest of all and I didn’t know what to expect. 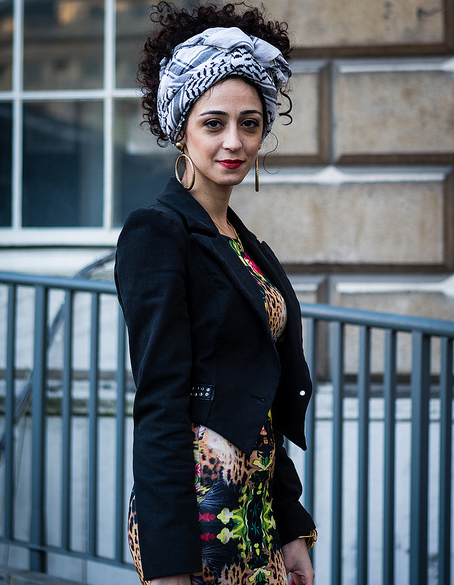 I wanted to wear the beautiful scarf from my Lebanese friend designer so I teamed it with whatever I found in my suitcase. Too bad I was busy at the exhibition all day so I didn’t take my photos except a close up of the scarf, which no doubt was the best part of the outfit! Day 2: Toton necklace, Bershka jeans, Dorothy Perkins top, H&M coat, Manolo Blahnik heels and clutch from Bali. This was my favourite look of all and the most photographed as well! Everything in this look I’ve owned for a while except the blouses which I rushed to buy to go with my collar. Thankfully they cost me 10 pounds (S$20) and were a success. I felt so comfortable all day and heard so many compliments regarding my Toton collar from the Cosmo crew and Harvey Nichols! Come on you UK buyers, take notice of Toton. 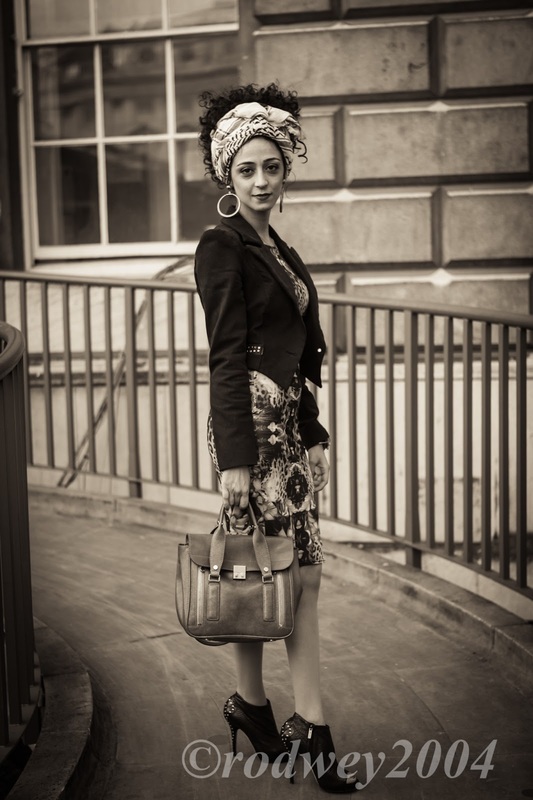 This look was featured in Comsmopolitan UK, Woman and Home, H&M streetstyle and ebay style collective (look under the Day2 pictures) among others. The sparkle of this skirt which I scored at the sale in Singapore has attracted a lot of attention and got photographed quite a bit. I wanted to team it with a trusty warm jumper and the lizard necklace and Indian bangles to accessorize and finished off the look with a touch of orange from the python heels from Singapore label Emblem. This look was sooo me and I’m glad I packed the skirt :-)! This look was featured in Fashion Clutter blog, H&M streetstyle again, Jewellery and accessories e-mag Adorn Insight and snapped by a couple more photographers who promised to send the photos soon. and a touch of bright orange! enough to snap me and send them over! On day 4 I was attending Eugene Lin’s show so I went with one of my favourite printed dresses and styled it with basic pieces and a touch of colour in shape of Emblem clutch. I think no matter how much I wear this dress I’ll never get bored of it! This was undoubtedly the most elegant look of all five. Who said you can't recycle one dress and wear it in every season? Oh and have you noticed those MMM for H&M plexi wedges which I got for a bargain a while back in Beirut;-)? Finally got to wear them too! clutch to this Paul Smith silk dress to take it through the seasons! By the time the 5th day came I was exhausted! I looked in my suitcase and found this dress which I had worn to death on every occasion but decided to give it a go again. The trick was to restyle it using the jacket, the kafeyya on my head and some quirky accessories. Think it turned out OK.
nice shots in this outfit! Next time I'll make sure I take more photos... if I can! 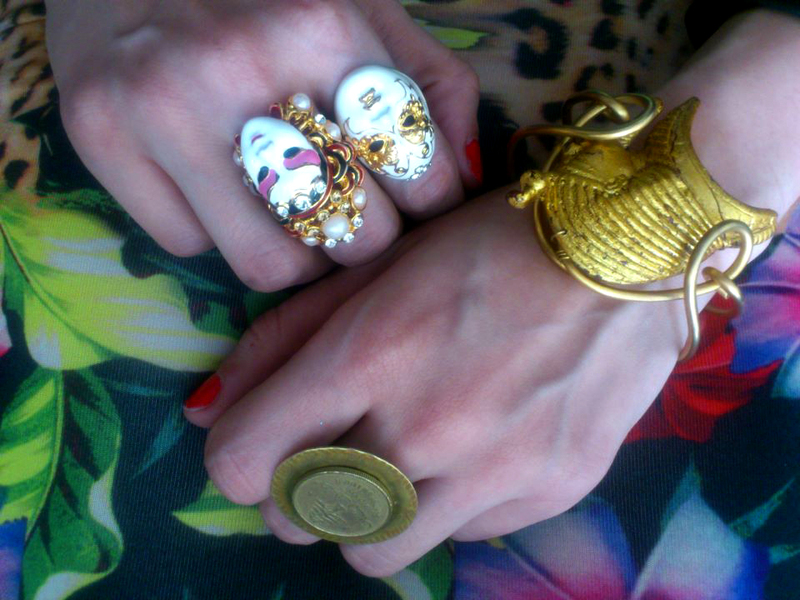 Arab/Chinese inspired rings and cuff from Paris market. I promise next time round will make a bit more effort and if it’s in London again, then I’ll invest in a statement coat which will make it easier to look chic in winter or alternatively pack more stuff!!! But I guess living up to my stylist reputation was what I tried to do on this occasion especially when it came to recycling almost all my outfits. Let me know what you think and which look you liked best. 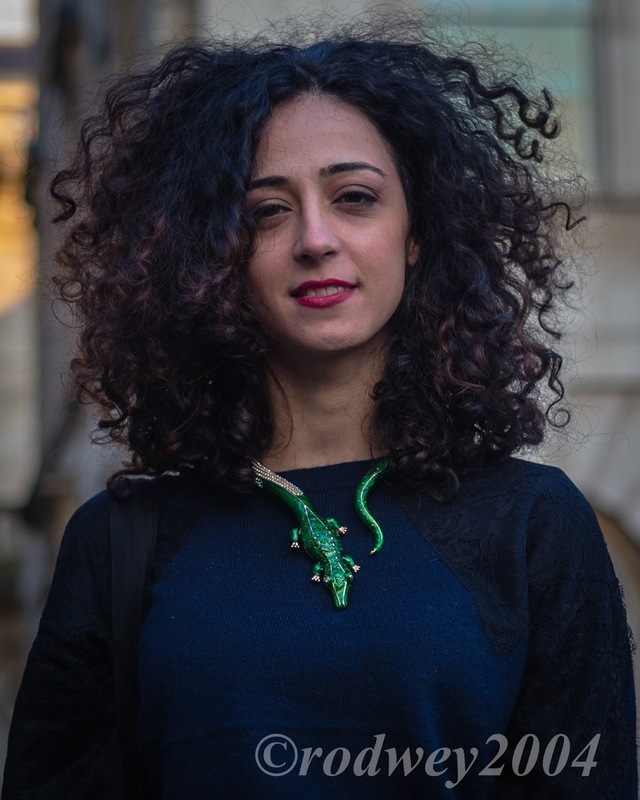 Bonjour Beirut: Johnny Farah's fabulous bags!